I'm so excited to introduce Toni from Hoosier Toni for today's Handmade Confession. I'm not quite sure how I found Toni's blog-- but I'm so glad I did! She's an incredibly talanted quilter who is gracious enough to share her projects with us. 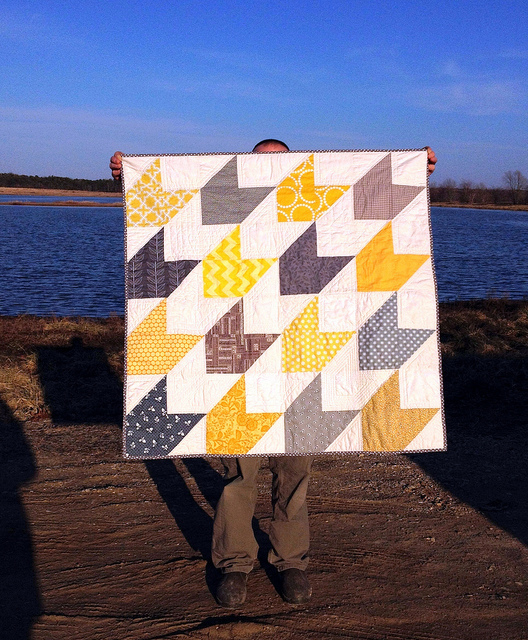 I love this baby quilt-- so on trend with those colors and angles. She calls this one her Dead Simple Quilt. I never considered doing an all solid quilt, but after seeing this I might just give it a try! 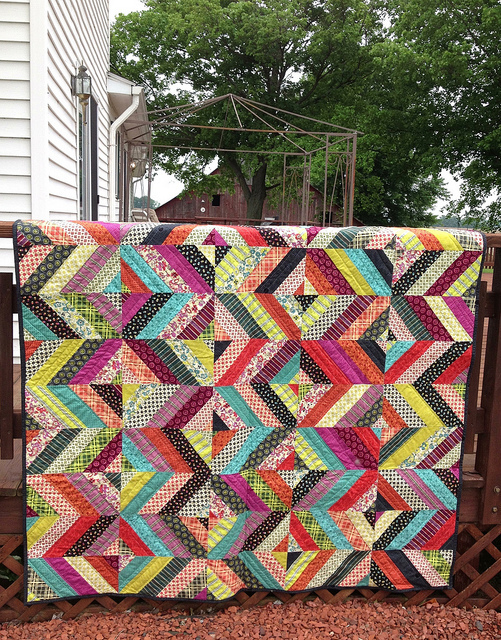 And everytime Toni blogs about this gorgeous chicopee quilt, I just have to run my mouth about how much I love the colors. I've seriously made the same comment on her blog 3 times! But just for old times sake-- Toni, the colors on this quilt are striking! I love it-- where did you get that fabric? And now, she's going to divulge a quilt binding secret with us. A woman after my own heart-- stickin' it to the bias tape mafia! This little tip just blew my mind! I admit, when Palak first asked me to be a part of this wonderful series, I was completely stumped about what I could possibly share. I don't exactly have any deep dark secrets or juicy confessions to divulge, so I was at a loss. Then it hit me....Toni, you're lazy!! So there it is, my confession to you: I'm lazy. 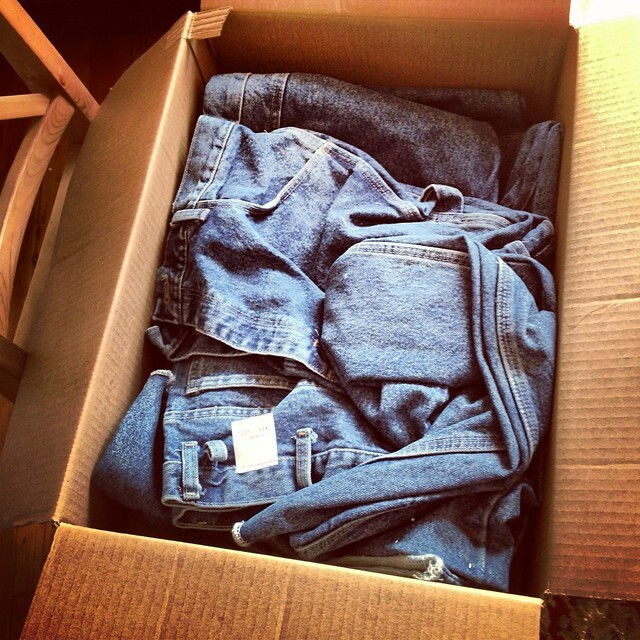 See this box of jeans? My husband's friend dropped them off at my house in April so I could hem them for him. Yes, you read that right...in April! I sew nearly everyday but somehow I still have not finished these jeans. I have done one pair, but somehow they legs ended up different lengths and I got irritated and quit. Do I feel bad that they are still here? Yes. But obviously not enough to work on them. But today I am also going to share a way that my laziness has helped me. I used to hate attaching bindings to my quilts and other projects! 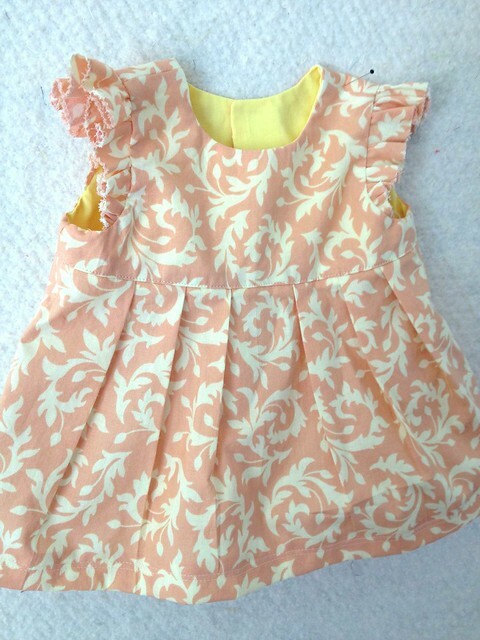 It was such a pain when you got to the part where you join the binding pieces together before you finish sewing them on. So many of the tutorials that I read had you sew it on almost all the way, then stop, measure, pin, sew, press, sew...Blah! Too many steps. So here's the way I do it. Now remember, I'm lazy, so I'm not going to go through the entire binding-making process, I'm just hitting the highlights here. Also, I tend to explain things in a confusing way, so hopefully the pictures help! Once you have your binding strips sewn together to the desired length and pressed in half, take the beginning of your strip and fold it at a 45 degree angle, as pictured, and press. 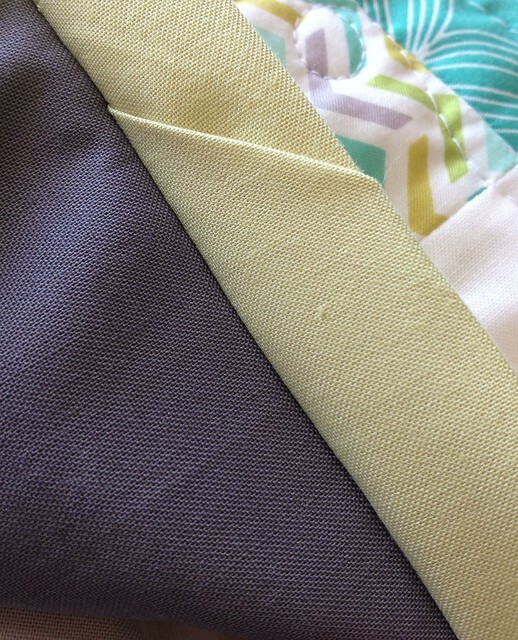 Then trim it 1/4" away from the crease, and fold back over so your binding strip is back to being half it's width. 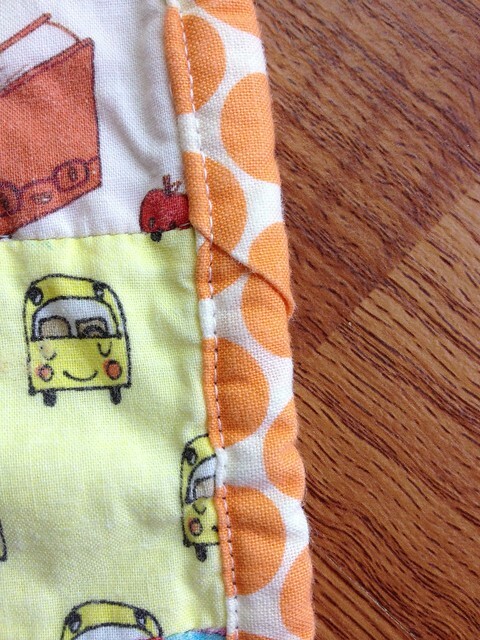 Pin your binding to your quilt or other project and start sewing about 1.5" to 2" away from the lower folded edge. 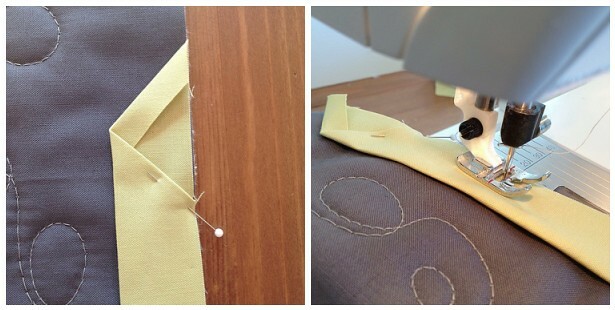 This is creating a little pocket for you to slide the other end of the binding into in just a minute. Continue attaching the binding to your project as usual but when you get an inch or two away from the beginning of the binding, stop and trim off any excess that goes more than 1/2" past the "pocket" that I referred to earlier. Make sense? About half of the time I decide to handstitch the pocket closed, but honestly it has never been a problem when I haven't done it. This is an I-Spy place mat I made for my kids about two years ago. You can see that I didn't stitch the pocket closed, but even after being washed countless times it hasn't been an issue. I'm sure many of you are horrified at my lazy approach, but it works for me! Thank you so much, Palak, for letting me embrace my laziness! Toni, thank you so much for sharing! We are most definitely not horrified. I just wish you had told me about this before I made all that binding for the Leftover's Quilt! Anytime you want to embrace your laziness, come right on over-- we can be lazy together. 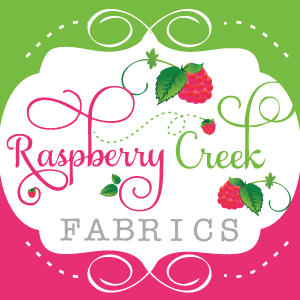 If you've ever been a lazy seamstress, head on over to Toni's blog and give her some comment love!